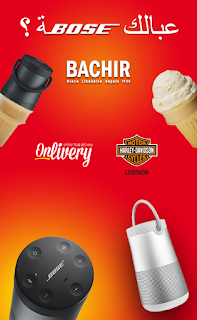 Here's the backstory, Onlivery is organizing a draw, and Bachir Glace (or Bouza Bachir) is offering a Bose portable sound system as part of it hence the pun in the ad "You feel like a Bose/a". It is "cute" (not too impressive just cute) but problem is, international brands have very strict rules of their logo - meaning you cannot say "Absolut's taste" you must say "the taste of Absolut (vodka)" so as for the brand not to be included in sentences or with possessive or whatever. So what Bose thinks of this is beyond me.